I feel so immensely happy as I type this post and I owe it all to our SRC Reunion event. Those of you who've been around here for a while, will know that I was part of this super fun group called the Secret Recipe Club. This was a lot of fun, sort of like Secret Santa for food bloggers. You were assigned a partner and you had to pick and cook a recipe from their blog and all the members would post about it on a pre-determined day called Reveal Day. I was part of the SRC right from June 2011 to November 2016, a little over 5 years. So when we wrapped that up, I knew I would missed this bunch of bloggers. Early last month, Sarah of Fantastical Sharing of Recipes, who happens to be our SRC boss lady ;) called out to all the club members and announced an SRC reunion event. Of course, I signed up for it and for this event, I was assigned Micha's blog, Cooking Mimi. Micha's blog is packed with great recipes. I had an absolute blast going through her blog and picking a recipe for today. After a lot of looking around I narrowed my choices down to this Hawaiian Pork, Potstickers (she even makes her own potsticker wrappers), Quick and Crispy Pork Cutlets and her Sweet Chili Pork. Have you spotted the trend here? I somehow happened to be zeroing in on Pork recipes. So this much was clear, I knew I was making Pork. 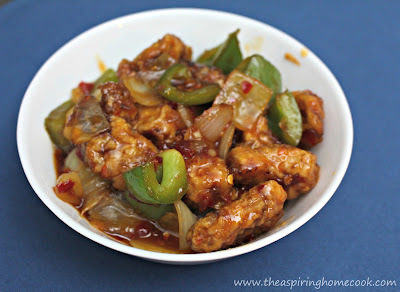 When I saw her recipe for Sweet Chili Pork my mind was made up. This is what I was going to make. Before we move on to the recipe, let's talk about this Sweet Chili Pork, shall we? This dish has it all with juicy little pieces of pork tossed in a sweet sauce with mild heat from the Sweet Chili sauce and the crunch of the onion and capsicum just rounds it off beautifully. I could not believe how easy this recipe was. I wanted to try it just to see if a recipe this minimal would hit the spot. And hit the spot it did. I am so glad I tried this out. My husband is not a fussy eater but he is my biggest critic and helps me work on recipes and tweak them. He was floored by this recipe. And I agree with him 100%. This recipe is very similar to the kind of takeaway meals we got back in Bombay, albeit not with pork, but with chicken. Thank you Micha, for an absolute stunner. I only made a couple of minor additions to the original recipe. I added some finely chopped ginger and garlic and some pieces of capsicum (green peppers) to the recipe. We served this up with some fried rice, but this would work very well with some noodles too. Heat 1/2 cup of oil in a skillet over moderate heat. Crack the egg into a small bowl, whisk it and set it aside. In another bowl, mix the flour and cornstarch. Cut the pork into bite sized pieces. Toss the pieces in a little salt and lime juice. Toss the pork pieces in the flour mix. Then dip them in the egg and in the flour mix again . Fry the pieces of pork in batches for about 3-4 minutes a side or until golden brown and crispy. Drain and set aside. Heat 1 tbsp of oil in another pan. When the oil is hot, add the onion and capsicum and stir fry till the pieces have just started to soften. I like mine a little crunchy. Cook it to your desired level of doneness. Add the finely chopped ginger and garlic and stir it around. Add the sweet chilly sauce and the fried pork pieces. Stir to coat everything in the sweet chili sauce. At this point, if you want a little more sauce in the dish, add some more. Toss well. Here's a peek at all my previous SRC posts. This sounds delicious. I love sweet thai chili anything. This sounds like a delicious and flavorful dish! Great SRC pick! It was Amy. Thanks for stopping by. YUM and I have pork pulled out for dinner tonight. Oooh this sounds delicious. I love pork with Asian flavors! It was Karen. I couldn't believe that something this simple could be this good. Sounds delicious - my family would love it! Yum! This pork looks delicious. I would love to pair it with noodles.